SwingFish is a Non-Profit trader community, with the strict aim of removing the conflict of Interest totally. So all tools, help materials, codes, and services provided are free of charge! Additionally, SwingFish is IB partnered with several brokers, but instead of pocketing profits gained from commissions, SwingFish returns those profit to the members, which leads to better a trading conditions. In cooperation with EnFoid Singapore, SwingFish offers a Risk-Free Program where instead of speculative wins, simple Interest is being paid, which completely removed the client risks. SwingFish is a registered brand owned by EnFoid. I joined this community roughly 4 month ago and in that time I have gained masses of trading knowledge from the community, much more than I could have hoped to learn if I was on my own. This community includes people that trade currencies, indices, crypto and stocks. It includes veteran trades from different timezones so the trading chat is almost never quiet. The owner himself livestreams his trades showing full transparency and is always happy to help newcomers. I would recommend this community to anyone that is devoted to building on their trading knowledge and improving on their trading. +Signals have good result, more than 50% success rate, and it's free. +They also giveaways indicators and Auto Hedge Algo for free. Positive community for Noobs and Pro's. I joined SwingFish.trade about 2 months ago as a complete newbie to forex. In these 2 months i have learned a lot of all the different kinds of traders that can be found in this community. I also have gotten a lot of personall information from swingfish himself. I love the fact that the owner himself is always very active and isn't a showoff or a faker. He trades live and shows off his losers and what he could have done better. + Commisions refund when signing up with his referal code and signing in for his enfoid company. - I have yet to find them. My Username on the swingfish community is known as franky-sir-candledick, im normally not the person leaving reviews - however after finding this section here I feel the need of doing exactly that. I'm a member on swingfish for 10 months or close to 10 months, I'm located in Thailand just like the admin and we found each other on the well known website trading view, where we instantly find connection because it happened to be we both are German too. he invited me to swingfish and told me about the concept to be a more professional counterpart to most boards forums or chats out there are mostly not really helping the learning curve but is more of a "I'm better than you" ranting space. 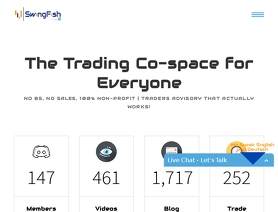 Those days swingfish was still small with just a few hundred members, within the 10 months of being a member at swingfish community we saw people coming and leaving, mostly the people can't give you proper reasoning about a trading idea or just are there to post their trading results left because that's what i guess none of the members rarely do like to see. To me what i like at the community is that nobody try to sell you s*** signals or lesions or things alike, you also don't find the average "blind callers" but the majority is there just for getting feedback or sharing ideas / concepts of trading - or in other words, what you have is the essential stuff one need to become a better trader and learn faster. Great channel to learn and share anything related to trading activities. I can honestly say that as someone new to trading, I learned the most from this site/channel. The community is welcoming and easily share any available tools. Also there is no impression that there is any push marketing. Clean and solid stuff. +Useful bots command such as Currency Strength Indicator and ATR in the chat room. +The owner keeps trading journals everyday, which are readily accessible. -No Automated Signals following for Metatrader and Cmirror for Ctrader. This review came from the same location used by Swingfish.trade's representative to the FPA. I really enjoy being part of the Swingfish community. There are a lots of helpful and expirienced daytraders from all over the world, which share trading basics, trade ideas and trading results. So you never feel alone, no matter what time it is. There is always someone who is trading and willing to help you. Marios Website (swingfish.trade) offers great value articles, which helped me on my way to become a consistant trader and generate a second income stream.